Below you will find a short list of four important cultural tips that will be very useful for you when you study Spanish in Peru and you’re living in Cusco for a while. Do you have more tips, things you’ve learnt during your Spanish courses in Cusco, or your stay with a Peruvian host family? Please let us know. 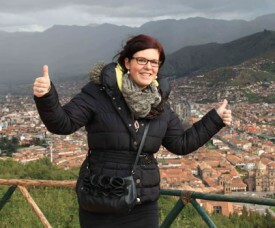 When trying to find a restaurant, hotel, or a certain street in Cusco it is always best to ask 4 or 5 people. Sometimes Peruvians may give you directions even though they are not exactly sure where your destination lies. They like to help people so they would rather give you an answer than not tell you anything at all. Also, if you ask a Peruvian how much farther until your destination, it is likely they will tell you just a little bit longer when in reality it is still a long ways off. In order to get the most accurate information, it is best to ask more than one person and take the general consensus. Cruising through the Vineyards of Mendoza ! When travelling through Argentina after or during your Spanish course in Buenos Aires, Mendoza is a place you do not want to miss. Mendoza is beautiful in many different ways, but mostly it is famous for its good, red wine. What some people may not know is that you can experience these tasty wines in many different ways. Tasting Mendoza´s wine is fun in itself, but savor the flavor even more with a fancy weekend package, a quick half day tour, blending your own wine, or renting a bike and going on an adventure! The last one is without a doubt the most exciting to do with a few friends or fellow students because you can take your time and enjoy some fresh air as well. Mendoza has many different bike rentals but the one I would recommend is Hugo’s Bike Rental. Hugo is a sweet, old man who runs his family business with passion and you can truly notice it by how he treats his guests. We were with a group of 8 international Spanish students from AMAUTA Buenos Aires and from the moment we arrived the staff made us feel at home. After we got our red bikes, a map of the wine paths through Maipú, some discount coupons, and even a place to pick up a free glass of wine, we were ready to go! Bus and “combi”, large vans, are the main types of transportation for Cusqueños. This is how they get to work, travel to other cities, and visit friends. There is no other experience that makes you feel more one with the people than to be crammed into a bus. Finding the correct bus can be difficult sometimes, but do not be afraid to ask others for help. 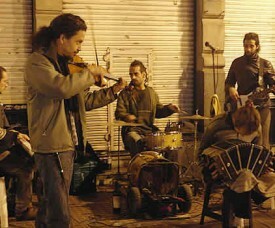 Peruvians are usually friendly and will want to help you. Before you get on a bus you can ask the “cobrador”, the person who takes your money, if it passes by where you want to go. Once on the bus, it is important to notify the “cobrador” whenever you want to get off. If you are unsure about where your bus stop is, then ask someone to notify you when to get off. Busses are very cheap and should cost you 0.70 soles. Here at the AMAUTA Spanish School in Cusco our Spanish students in Peru and our volunteers are about to experience Easter or Holy Week in a whole new way. 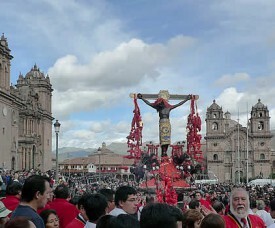 “Semana Santa” is approaching quickly and it is made obvious by the growing excitement of both locals and foreigners. Many Peruvians are planning their trips to travel and be close to family during this important time. 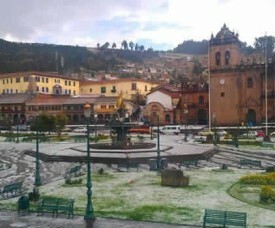 Most schools and most businesses in Cusco will be closed on Holy Thursday and Holy Friday. The Semana Santa is significant as it observes the week leading up to Jesus´ death, burial, and resurrection. 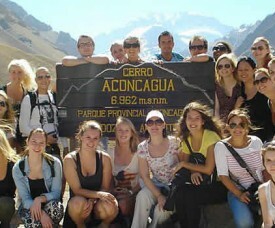 For our students a unique way to learn about and live the Peruvian culture. You are almost sure to see a person making sandwiches on every corner. Usually commuters who are going to work, or coming back from their work buy the sandwiches. The people who make these sandwiches all look very different, one may look like a ‘chic’ car-seller and the other like a maintenance man who is repairing cars.